I was lucky enough to be chosen for an artists retreat on great spruce head island in penobscot bay in 07, the summer home of painter Fairfield Porter and photographer Elliot Porter. the family still owns the island and keeps it as authentic as possible complete with wooden boats for daily adventures. being in the middle of the bay gives you a front row seat to the whims of the weather like watching the last remnants of the morning fog drift away. Looking back towards sand beach in Stonington, Maine. Love the lumpy granite shapes and the way they make me feel. 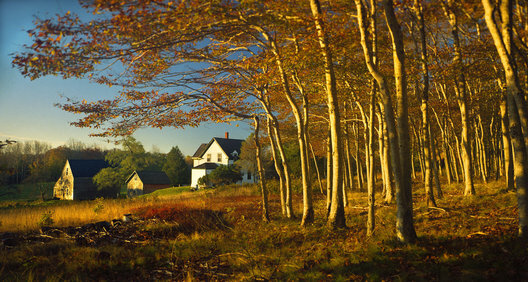 this beautiful little new england farm has a perfectly manicured beech grove hiding it from the road. all the trees are heathy too with no evidence of the blister blight that infects so many beeches in the area. i waited until the fall on a clear day when the leaves were giving their best performance reaching out to the once busy farm. deer isle. 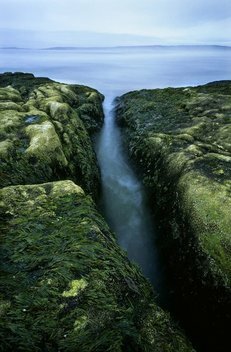 there are so many nooks and crannies along the maine coast that gurgle and bubble with the rhythm of the tide. its always very calming to watch the seaweed flow back and forth in these little tide pools. 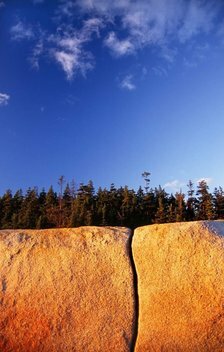 this outcropping was the only one on the entire beach at the bates-morse mountain preserve in phippsburg, maine. 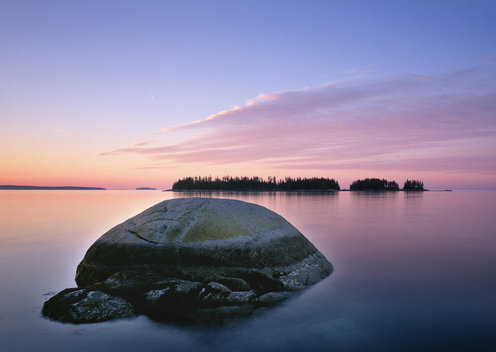 this island is just off stonington and looked like a good spot to watch the fireworks on the 4th of july, 2005. like many of the islands around stonington, this too was partially quarried for its granite, leaving the large cleaved face. lichen and the little yellow stonecrop flower soon moved in and caught the fading summer sun in the best way. 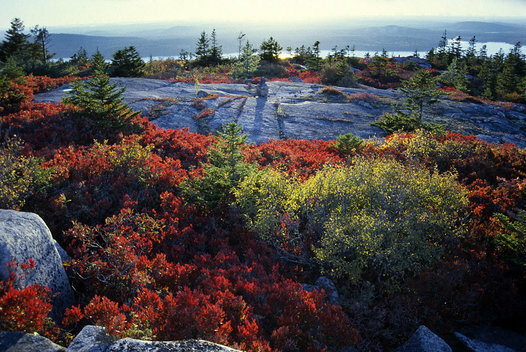 blue hill is really at its best in the fall after the blueberries have been all gathered and the leaves reveal their true colors. This shot was taken from the top of stover hill just a little way down the grindleville road, ( which I strongly suggest anyone walk the full length as it ends up at the old pines cemetery on the blue hill, sedgwick border.) 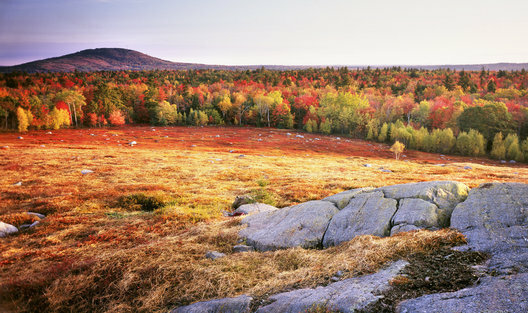 stover hill offers the best view of blue hill and acadia national park and is a great place to watch the day begin. Seawalls are big berms of smooth beach rocks pushed up by storm waves commonly found along the coasts of Maine and the Maritimes. They tend to get bigger the farther down east you go probably due to the higher tides. They often have a pond, bog or, at worst, a damp spot behind them as the runoff and seawater from storms has trouble draining out. This one is on Great Spruce Head Island in Penobscot bay. Bog loving sedges have colonized and arranged themselves just so in this seawalls backyard. 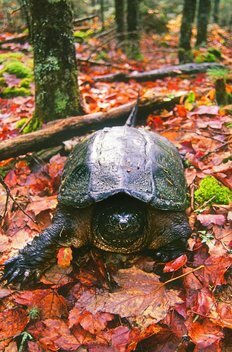 i found this big snapper pretty close to fourth pond in the kingdom woods trails on the day the blue hill heritage trust opened this new 690 acre preserve in october of 04. he was very cooperative for this portrait, probably because he knew he would be heading into the mud under the ice for 6 months. birches one of a series of single species north american forests. 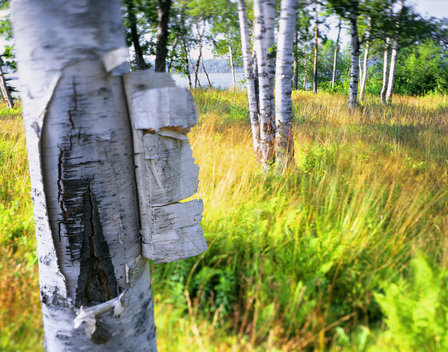 this birch grove is along the bagaduce river in brooksville, maine. this one birch tree seemed to be opening its heart to me so i thought i2019d include it in one of my photographs. At 1094' it's not a big mountain so a short hike will get you to it's bald granite summit in no time. The views of Acadia National Park are incredible. Rarely have I seen other people up there and yet all over the summit and ridges are small scale rock cairns and sculptures that make it seem enchanted. It may be, in a small valley between the two summits is a small hardly accessible tarn named wizard pond. 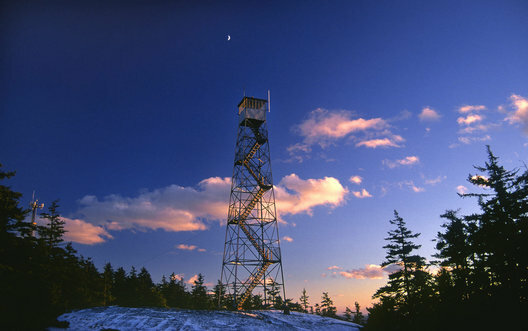 I took this picture a couple months before this iconic fire tower was dismantled. Most folks who hiked up blue hill went up the tower for even better views. All over north america these towers are being taken down for lack of funds, maintenance and safety concerns. I'm glad I caught this one at a beautiful moment. when big storms are way offshore in the atlantic or even when they are bearing down on the maine coast up close, schoodic peninsula in acadia national park is the place to see big waves come ashore. one beautiful afternoon these rollers were coming in after being sent from far away. this part of the park is seldom crowded and in the off season it feels like a small wilderness. 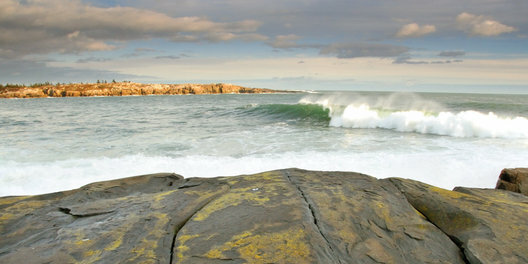 with the waves, ledges and islands, it's a classic maine scene. 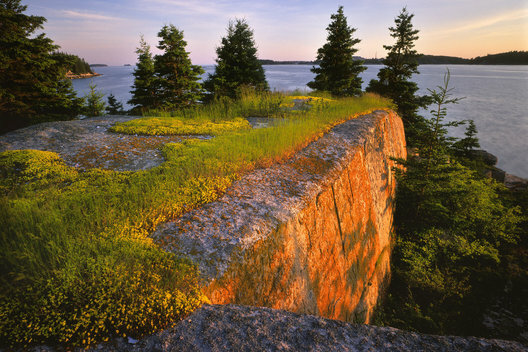 the granite shore along the haystack mountain school of crafts on deer isle is not only an incredible inspiration for artists of all mediums, but it is simply a very powerful place to be. the lighter spot in the water between the two ledges is a white sand pocket beach at low tide with these ledges rising above you by 8 feet or so. a very intimate place. 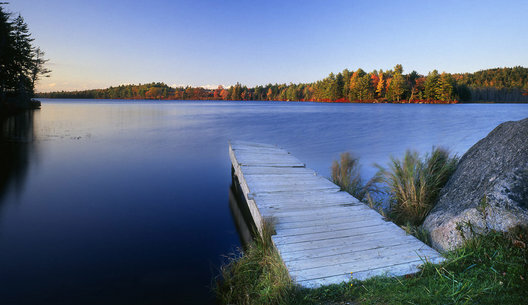 the blueberry barrens in downeast maine are amazing, especially when they overlook a pond or the ocean. 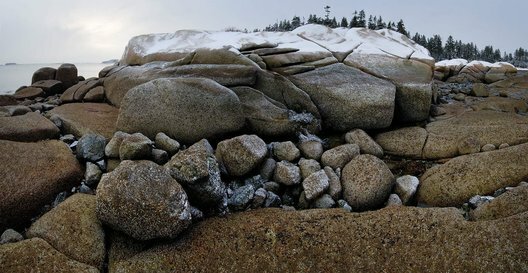 granite ledges often poke up through here to give a feeling of alpine tundra. There are also lonely boulders who long ago were thrown from the glacial bus they were riding to the sea. Here, one such boulder found a nice spot to sit and watch over walker pond on the blue hill peninsula. my parents have a little cottage down by the upper reaches of the benjamin river in maine with tall elegant hostas (my favorite) swaying gently in the breeze all in front of it. 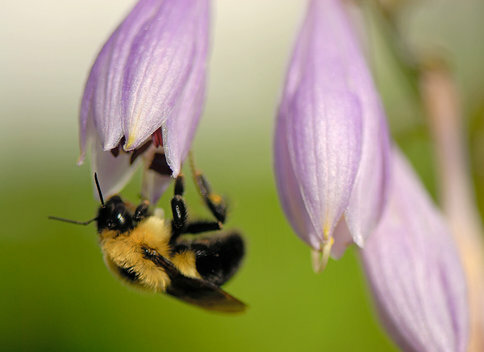 bumble bees are always happy to hang under the umbrella of these flowers to do their business. Buzzzz. This was a beautiful, almost too spectacular, sunset on a january evening with a little slot of clear sky at the horizon for the sun to do one last show before it went down. It only lasted 1 minute at the most before the color left the room. This photo was taken just before deep cove sunset #3 which I think is more calming. 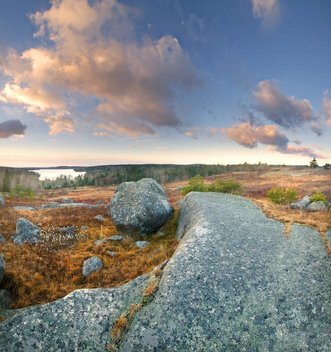 frost pond is a rare undeveloped pond on the blue hill peninsula in sedgwick surrounded by bogs, blueberry barrens, and mixed maple, oak, fir and pine forest. I wanted to get the leaves at their peak colors and capture the quietness of this unique body of water. this ledge is just past billing's diesel and marine in stonington, maine. 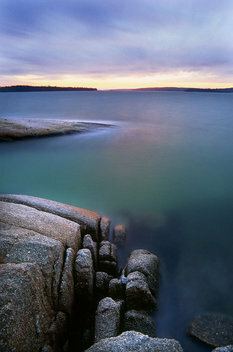 it's east to find exposed granite ledges most places along the shore in maine and south shore nova scotia. their lines are so sculptural, they imitate art on their own. 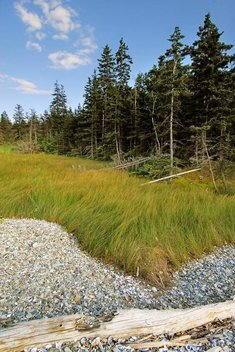 the cutler unit of maine public reserve land includes 4.5 miles of undeveloped coastline with 100 foot cliffs and 12,000 acres of bogs, meadows, ledges and coast. the day i visited this spot it was blowing 40 or so and I was hit with sea water splashing up 70 feet to my cliff edge perch. 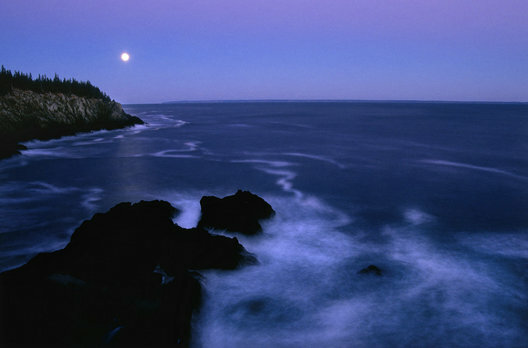 grand manan island can be seen on the horizon. 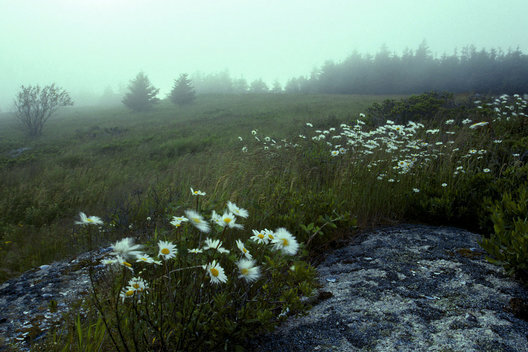 fog rolls in off the north atlantic fairly often in the warmer months and condenses on the black spruces on top of little knobs along the coast. when the trees are saturated, it rains in the forest and can do so as long as the fog lasts creating a very moist micro environment that sees a lot more rain than land 1/2 a mile away. 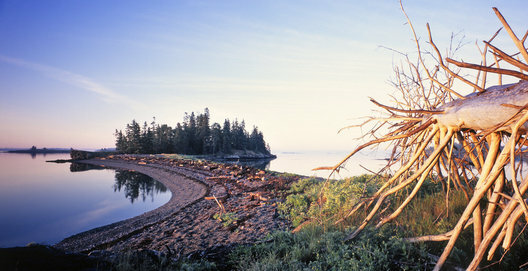 these forests are at risk of disappearing along coastal maine due to increased development. 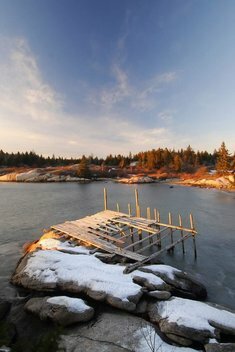 my favorite spot on deer isle is out by sunshine on a skinny , grassy peninsula with a curtain of white spruces on the north to keep the north wind at bay. it is a perfect spot to roll around on your belly, hop up and down, graze on blueberries and most important...napping. Once again on great spruce head island trying to capture that amazing morning light as the fog clears just a little over calm waters. The double beach on great spruce head island in penobscot bay, maine was made famous by two brothers, photographer Elliot Porter and painter, Fairfield Porter who summered here years ago. Here is my take on a nice morning with the fun addition of a fallen tree to soak up the golden light. 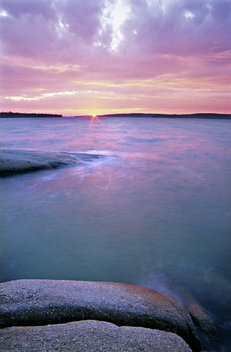 this view is from conary point on the east end of deer isle, maine. lazygut island is on the horizon. the boulder was just so perfectly surrounded by still water illuminated by the rising light. 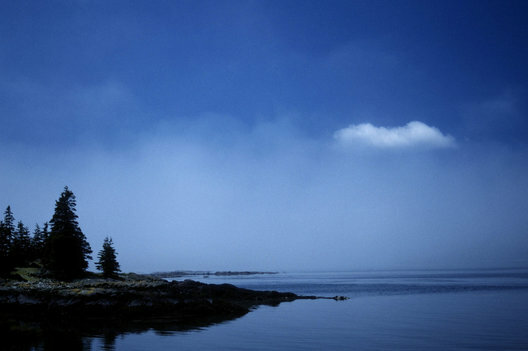 deer isle has too many classic maine seascapes to count. 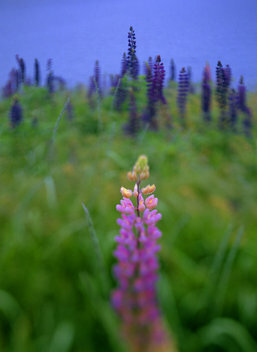 my parents backyard in sedgwick is cut once a year to let the lupines come back every june. these huge flowers are a classic sight along the maine coast. thislone pink spike was all by itself in a sea of purple. I had seen this ledge from the fishing boats I had worked on and its single vertical crack made such a bold statement, I spent some time trying to translate what it was saying to me. 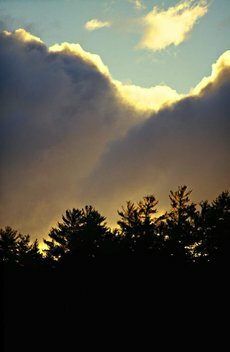 It seemed to be celebrating the clouds and sky on this windy winters day. stonington, me. a lot of elementary schools are consolidating these days and when they do the old ones are at best converted to community centres. at worst they are torn down and sometimes their playgrounds are left to sit with no one to do the maintenance. 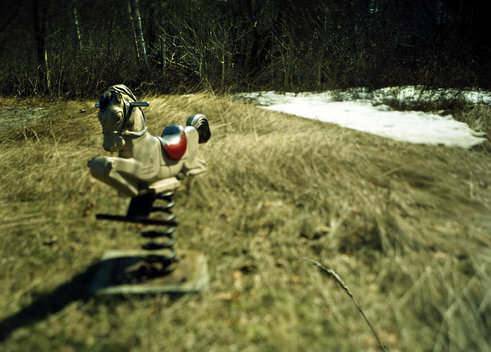 this bouncy horse waits for an eager rider at the old Deer Isle Elementary school. for me it is always a bit sad to see a playground with broken equipment being over taken by the local greenery. i can only imagine the happy children that once played there. we have a pear tree next to our cottage in sedgwick, maine and every year it produces so much fruit that the branches break with the weight of all the juiciness. We have taken to thinning the fruit once they get to be about a half inch in diameter. 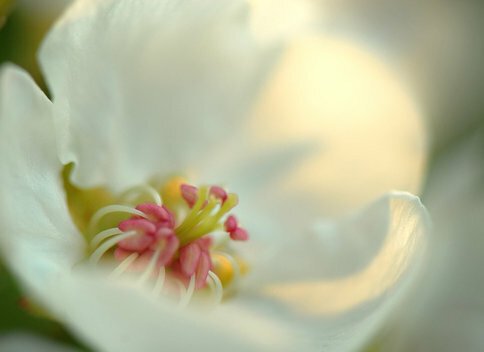 Thinning the blossoms is not an option as they are so beautiful and provide that petal 201Csnow201D when the wind blows. 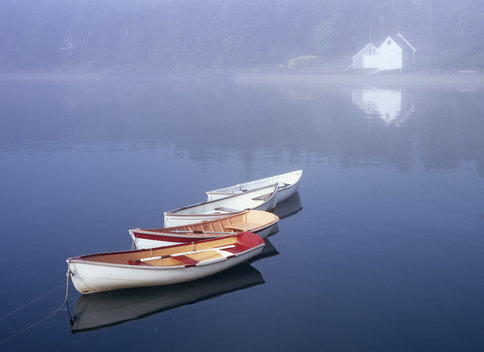 i learned to sail at the wooden boat school in brooklin and was spoiled rotten in beautiful boats. even today, fiberglass and aluminum make me sad. pegotty is an 1860 reproduction of a narragansett bay fishing boat. at 18' long and 9' wide, this gaff rigged cat boat with rocks in the bilge, one halyard and one sheet was soothing and easy to sail. sand beach in stonington, maine is private property but the owners are very generous to let the public use it responsibly. This old pier was a classic sight here for a while, but it came down a few years ago. some resourceful fisherman made it so he could more easily load his lobster traps and gear and no doubt it adds to the iconic flavor of stonington. these white pines are along the shore in blue hill harbor. I couldn't resist this shot with the bands of light made from the water, shadow, trees, sun, clouds and sky. that was a mouthful and so it should be. 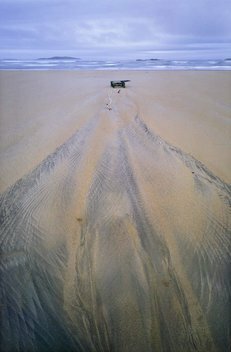 the beach on the bates-morse mountain preserve is a serene stretch of uncrowded sand that seems to collect a fair number of lobster traps in the summer and fall. angry storms push them up out of their way when they blow in. as the tides wash in and out, they are slowly buried and twisted into piles and their ropes are arranged into smooth lines of grace. this lone trap seems to have lost most of its rope but left a beautiful eddy pattern behind. this sand beach is in stonongton. its just a cute litte pocket beach in between some granite outcroppings that's a popular place for locals to hang out, swim, and watch the beautiful sunsets. this is one of my older photos whose date escapes me. I know it was in the fall on a windy afternoon along parker point road where the little salt pond is looking out into blue hill harbor. 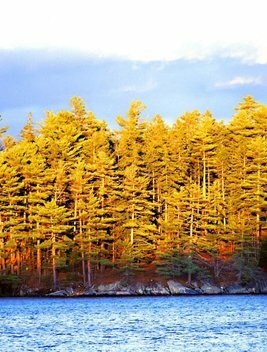 This image is so calming for me and when I see it, i can always hear the distinctive whoosh of wind through white pines. these are my favorite kinds of days with the clouds passing by making shapes for us, blustery with cool temperatures and clean northwest air. 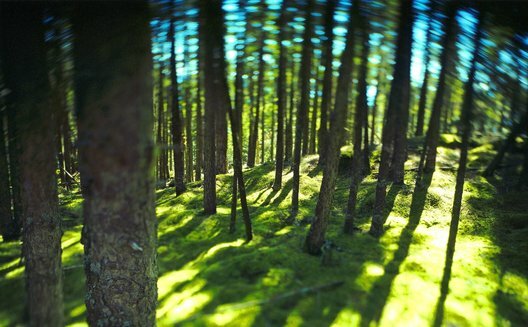 nikon n50, kodak evs 100, circular polarizer, exp. unknown. there used to be quite the charge of houses on york at the turn of the century. 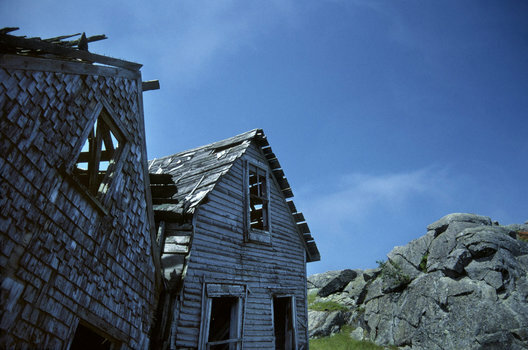 these two buildings used to be an old inn and they are all twisted and bent from gravity's' slow, deliberate burden. 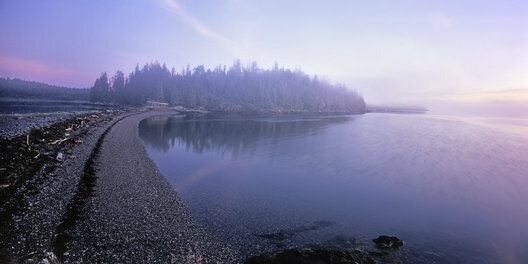 york island is just to the east of isle au haut and is privately owned. the southern half is all bare from sheep mowing the grass and the north is a snaggle of old weather beaten white spruce. york is said to have its own weather pocket. chinook like winds blow in from the heights of isle au haut when all else is calm and fog glides in when it was clear only moments ago.